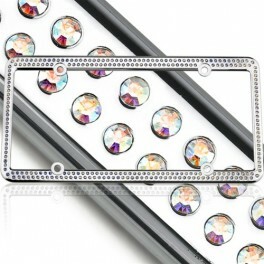 Make other cars jealous with the License2Bling 256 Series Frame. The 256 Series is similar to the VIP but with, as the name implies, 256 genuine Swarovski™ crystals. With rounded edges, mirror-like triple chroming and heavy-duty cast construction, the L2B 256 Series will be your car's new favorite accessory. Due to popular demand, 256 Series Frames are now available in Aurore Boreale, Light Sapphire and Red! Each industry has its Rolex or Rolls Royce. In the crystal business, the ultimate is Swarovski™. For over 100 years, Swarovski™ has provided jewelers with the most exquisite crystals for their pendants, necklaces and accessories. We are pleased to be partnered with Swarovski™. From a distance and up close, nothing compares to genuine Swarovski crystals. A crystal is only as beautiful as the number of facets (sides). We choose only the Swarovski crystals with the most number of facets for our products. The effect is immediately visible - when the sun hits multiple facets, it creates a rainbow of color rivaled only by diamonds. Additionally, L2B Swarovski crystals are all chaton-style. No flat back crystals, the chaton crystal features a pointed back that doubles the number of crystal facets. With our chaton crystals, the brilliance and color is stunning. 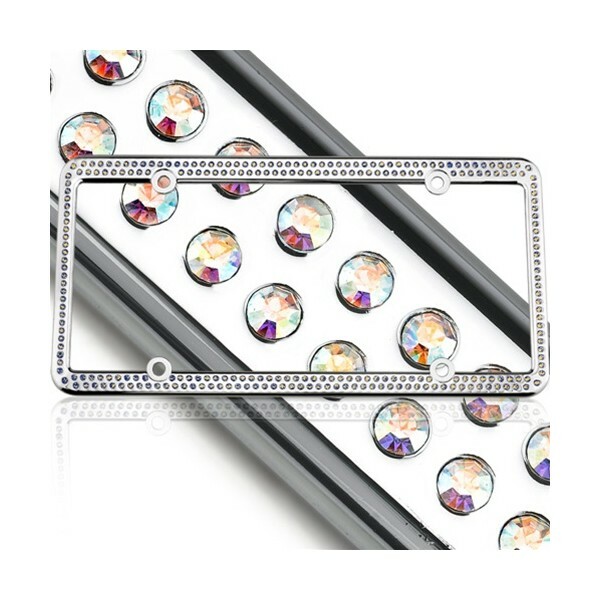 All License2Bling Swarovski products feature our proprietary Precision-Bright Embedding™. Where typical crystal-covered products are simply flat-back crystals glued onto a flat surface, L2B Precision-Bright Embedding™ places the crystals deep inside the steel frame with jewelry-like precision. With Precision-Bright Embedding™, the visual effect is stunning - the crystals shine with brilliance and the style is far more professional. Additionally, Precision-Bright Embedding™ means the crystals are in the frame to stay. L2B Frames and accessories are all made out of high grade metal alloy and silky smooth double chrome. Additionally, L2B products are thick and substantial. Plastic or stamped metal products are instantly identifiable as cheap and flimsy. L2B products, with the thick steel construction and high quality chrome, are the world's highest quality crystal car accessories for your car. No generic machine construction here. All License2Bling products are built by hand in the time-honored jewelry tradition. Our Swarovski crystals are hand-placed in the frame and double-checked to ensure perfection.